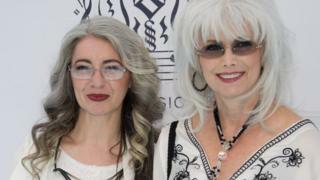 Scottish percussionist Dame Evelyn Glennie and country star Emmylou Harris were praised by Barack Obama as they received the 2015 Polar Music Prize. The US president sent congratulations to both laureates, adding: "Music brings people together in an increasingly interconnected world. "It helps bridge differences, lift hearts and challenge assumptions." Dame Evelyn said she "never imagined" she would win the award, considered to be music's version of the Nobel prize. The musician - who has been deaf since the age of 12 - was accompanied to the ceremony in Stockholm by her mother and her childhood percussion teacher, whom she had not seen in 25 years. Accepting her honour from King Carl XVI of Sweden, she described the Polar Prize as "important and symbolic". "It's an institution that brings together people of all kinds, whatever their culture, age or beliefs, in a celebration of music's power and diversity. I want to thank tonight's superb organisers, the Swedish people for their hospitality and of course the prize committee for awarding me this prize." Harris, from Birmingham, Alabama, has recorded more than 25 albums over four decades and was inducted into the Country Music Hall of Fame in 2008. She has collaborated with artists from Bob Dylan and Gram Parsons to Willie Nelson and Beck, and is the subject of the 2012 song Emmylou by Swedish folk duo First Aid Kit. The duo read Harris's citation at the ceremony, and played their song at an after-party. "We never thought we'd get to sing this song in front of you," sisters Johanna and Klara Soderberg, said to Harris. Bruce Springsteen also sent a message of congratulations to the country star, saying: "Thank you for gracing our songs with your voice over the years." Harris had earlier given an emotional acceptance speech, which moved some members of the audience to tears. "I have only one regret on this magical evening, that my beloved parents, Walter and Eugenia, did not live to share this with me," she said. "It didn't matter to them if I was successful or not, they only cared for my happiness. Their unconditional love carried me through good times and bad and will abide with me whatever the future holds, 'til my journey ends." Since the Polar Music Prize was founded by Abba manager and lyricist Stig Anderson in 1992, it has honoured musical achievements and boundary breaking. Each year it recognises one laureate from the contemporary music world and one from the more classical realm. Previous winners of the Polar Music Prize include Sir Paul McCartney, Chuck Berry, Patti Smith and Youssou N'Dour. As well as their trophy, Harris and Dame Evelyn were each awarded one million Swedish krona (£78,560). Organisers called 2015's laureates "richly deserving" winners with "exceptional music careers". "Both represent the spirit of the award that my father envisaged when he founded the prize," said managing director Marie Ledin.